The last of the Himalayan kingdoms, there’s nowhere on earth quite like the majestic Bhutan. And, this is the perfect time to visit this beautiful land, if you like to experience the traditional Buddhist dances and rituals. Paro tshechu, held every Spring in the Paro Dzongkhag, is considered the most spectacular and colourful of all the festivals here. This year, the festival has started on March 17 and will be concluded on March 21, 2019. The Paro Tshechu is one of the biggest festivals in the country. On the first day, all mask dances are held inside the courtyard of the Dzong. In the subsequent days, the courtyard outside the dzong hosts the festival. The festival has been held annually since the 17th century when Zhabdrung Ngawang Namgyel, the founder of the state of Bhutan and Ponpo Rigzin Nyingpo initiated Paro Tshechu festival together with the consecration of Paro Dzong fortress in 1644. Paro Tsechu is held for 5 days beginning on the 10th Day of 2nd Bhutanese lunar month and ends on the 15th day. 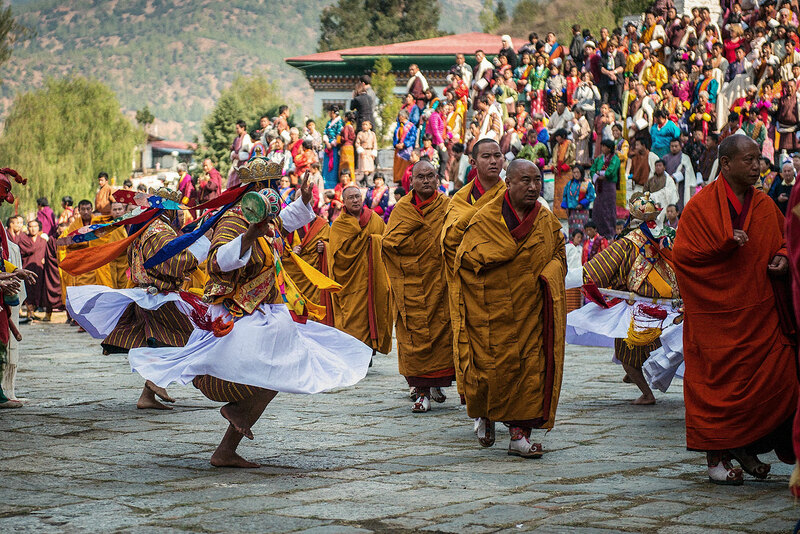 The Paro festival offers a best opportunity to witness the Bhutanese’s rich culture and history. It is also a yearly social gathering where the people come together to rejoice dressed in all their finery. On the last day of Paro Tsechu there will be a display of a gigantic thangkha (embroidered painting), the Guru Throngdrol. Thongdrols are especially impressive examples of Buddhist art and never fail to amaze viewers. They are considered so sacred that simply seeing a Thongdrol is said to cleanse the viewer off sin. Each dance has a special meaning and a moral message and is based on events and legends, showing compassion for sentient beings, and is considered a form of meditation. The monks and the public, dressed in elaborate silk brocade costumes, perform festive dances of good to the loud sounds of trumpets, cymbals and flutes.